An easy method of learning to identify birds in your backyard is learning to identify birds by color. Feathers give birds the colors that catch our eyes. Are you trying to identify birds by color? Have you seen birds that are red or have touches of red? Here is a photo gallery of birds which are red with their common and scientific names. Some might even call some of the birds orange in color. I left out some orange birds to be included in my “Birds by Color: Orange” post for next week. I included both male and females, if the genders look different. In similar species it helps to pick one or two “identifiers” or markings you can remember to tell the birds apart. I will try yet again this year to tell House and Purple Finches apart. A male House Finch eats form the bird feeder in my backyard. Photo by Donna L. Long. Notice the difference between the House Finch and the Purple Finch? The Purple Finch male has a lightly rose-colored breast with no streaking underneath. The Purple Finch has more red on its’ head or cap than the male House Finch. The House Finch has a more solidly colored breast and is heavily streaked beneath the breast and his head is not completely red. The Purple Finch female has clear streaks and the House Finch female has muted streaks. See the difference between the Summer Tanager and the Scarlet Tanager? 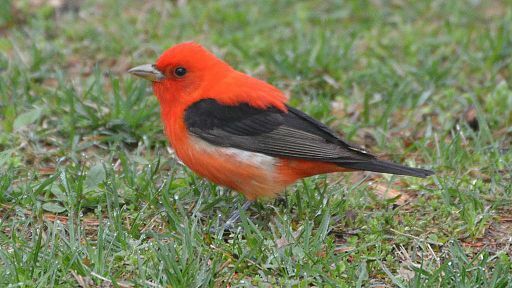 – The Scarlet Tanager has black or very dark wings.